I want to call upon the nation to reflect on the 2016 elections. In the wake of the mind games being played by our colleagues in the UPND. This incessant attack on the United Nations appears to be on one all too many scripts played by politicians that prelude civil unrests in most waring nations. Ahead of an election, studies show that in politically unstable nations politicians early enough prepare their supporters and people for a deeply bitter and divisive election. Empirical evidence shows that there is always a systematic scheme before a bitter election against the credibility of local and international organisations. It can only be hoped that those doing so are not preparing the minds of Zambians for something BIGGER in 2021. Its bad math to smear a campaign against international organisations for political expediency. It will hurt them. The UPND must know that this Twitter diplomacy is a double- edged sword. A political party seeking to form government must have a properly structured strategy towards the international community. As a party they must have a well thought out indepth diplomatic etiquette where personal equations and what is often not said makes all the difference. A dumbed down diplomatic route may be attractive with its instant public responses and outrage but what it does in real terms is grave. What we are being subjected to by the daily insults on Ms Janet Rogan and its subtle nuances diplomatic capital wise is clearly uncalled for. This just needs to stop, the kvetching and blame game. What the UPND is saying is that the UN stole elections on behalf of Patriotic Front. The UPND should realize that Janet Rogan didn’t come here in her personal capacity but she represents the UN itself. And for their information Ms Janet Rogan has supervisors and has no single handed power to prevent any such report on elections concerning a nation from publication. Again what the UPND and their leadership perhaps deliberately does not know is that the UN on elections report in two phases. The first report is basically a testimony to whether the election met the minimum threshold standards of a free and fair election. Which is for public consumption. Then the second report, I suspect the one they are are referring to, is an internal report that takes into account all the incidences and challenges, for purposes of helping the UN itself find the appropriate technical assistance to render the nation for its future election. It is from this report that the UN begins to strategically support electoral and human rights reforms financially and human resource wise to enable a conducive election environment which is incident free. It is purely perplexing to see the UPND start wars with all stakeholders in this Country. It is also laughable to see how the UPND resort to thinking that the departure of Ms Rogan would win them the next Election. It is not the first time HH and UPND have lost elections. They have lost the presidential elections five times and might lose again because its not guaranteed they may win. What should we expect in the next elections? It is indeed preposterous, according to the UPND; The ECZ is corrupt, the Police are cadres, the Judiciary is Biased and Compromised, the AU and SADC inept, the International Community impotent in the wake of their alleged stolen victory. No political party that has lost an election must subject itself and its supporters to a 2 year pity tour blaming everyone for their loss. Their loss has been put on everyone but of course, it wasn’t their fault, it was everyone else, who did it to them. It’s easy for the UPND and HH to blame everyone but themselves. They forget that these type of moves in politics make them unlikeable or untrustworthy. Their character flaws cost them elections. One can’t have it both ways, to insult everyone and expect their support tomorrow. They display an astonishing lack of empathy for fellow citizens. The next they will drag in their politics of the mud is the Pope; the Pope for Catholics. Next we shall hear them claim the Pope instructed his Priests and Bishops to steal their election victory. I say these things as though its a matter of a joke, but it is a serious issue. 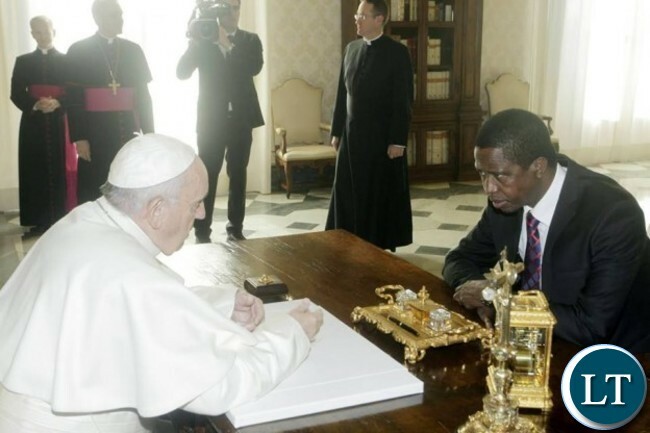 The Pope met President Edgar Lungu prior to the elections. Does it mean he also stole their election? This type of politricks is not healthy, they must take responsibility and move on. Isn’t it somewhat hypocritical to be on one hand mobilising the party yet on another hand cry over a lost election? Next we shall hear them say all Chiefs except those that are aligned to them stole their election victory. In this case who really stole their election victory? Doesn’t it ring a bell in their minds that being at loggerheads with Ms Rogan regardless of what their claim is means being at loggerheads with the UN and consequently the International Community? Doesn’t it ring a Bell in their minds that there is just that time to move on for purposes of healing a nation. The UPND and HH have constantly been shifting the focus and blaming everything else and everyone else besides themselves. My advise would be this is incredibly counterproductive to the principal task that lies in front of them which is to figure how they are going to construct a viable alternative to the political movement in Zambia that is in ascendance right now. Take responsibility and move on. As a young politician, I call upon them to sacrifice their loss on the altar of love for this nation, in the interest of peace and national building. And they will be remembered not as weak leaders but as leaders that embraced the “POWER OF LOVE” over the “LOVE OF POWER.” This in the wake of a forward looking political dialogue process, may YET remain the light that is at the end of a very dark tunnel. In conclusion, we are meant to believe that our founding fathers, did not envision of a country where fellow Zambians would exchange hate in place of handshakes. Those that brought democracy envisioned a situation where a man would make a national call after he has lost an election that he perceives was manipulated just to save millions of lives. We need leaders that in all honesty believe an election is not a war, and an election must not lead to war or tension. Leaders who can guide their members that there is no winner and no loser, but we all want a better country today and tomorrow. Indeed there lies great untold strength in this weakness. Walasa mwaice. But when a person is completely focused on a problem or disappointment, he does not think properly. I didn’t even bother reading the article from a brain-washed Zealot PF00L. LT is also fast becoming PF propaganda mouthpiece. Sunday Chanda now an LT editor? For as long as UPND does not rule Zambia there will be no peace in Zambia! False insinuations, addition salt to injury. If the 2016 elections are still that much an issue, why can’t we get to the bone and marrow and get the exact story? We owe it to ourselves that we do so, that we do not continue to be fed on fables. !mbecile Ndoyi, leave Holy Father out of your CRIMINAL ASSOCIATION crapping. It is YOUR CRIMINAL association which is peddling unholy fake news that Endemically Corrupt Leader is “anointed one”. How its possible that CONVICTED EMBEZZLER be “anointed”? Total pit latrine material……did not even bother reading…. Pf cadres, what is a label group? So what is the difference with Rogan? In my opinion she is worse because she has transgressed the people of Zambia not just a party. In this case it should be what is sauce for the gander should be sause for the goose. Ndoyi, was the Cuban ambassador not deported for the PF claiming that he was practicing partisan politics? I agree with you Ndoyi, likewise when you set out to find the cause to your roblems in other people, you will never find them because they are not there, they are in you. Once anger or hurt enters the mix your objectivity will give way to self preservation. People are failing to sleep: HH – please do not be troubled with the world it is going away with its beauty: Your friends are fighting for places in Heaven. May ask you to read Matthews 6: 19 – 34. PUT YOUR TREASURES IN HEAVEN. Whether you are UPND or PF the world is remaining soon. Anything is possible. No need to say more. Just over the weekend Odinga called on kenyatta, the shook hands and Odinga promised kenyatta a tough run in 2020. As usual, comment with FAKE NEWS. Du you d!ck 5ucking !mbecile know when is next Kenya election due? I can see leadership in this young man. Let those who have ears hear. Dr. Kaunda did not believe that he lost the 1991 elections genuinely. But for the sake of preventing bloodshed he handed over power. For HH to insist that votes were stolen from him is an insult to those who didn’t vote for him and for this reason he won’t get sympathy from them. Please Badala move on you are being ridiculous. Jabule, yes elections were lost and not stolen. @9.1 Isn’t it not too long ago when Odinga was crying that he did not lose? Abilima please rephrase your question. pit laterine thinking ka Ndoyi..useless noisey vessel.. Ethnic hatred is a recipe for continued hatred When pf is wrong the loud mouths cry blaming Upnd.They always want UPND to be quite.We cannot all have the same views and opinions.Talking of UPND every time they have a complaint is like tramping on divergent views. If the Pope writes an email saying HH will permanently vanish from the public eye, then the UPND will have every right not to happy with him. …..”It is indeed preposterous, according to the UPND; The ECZ is corrupt, the Police are cadres, the Judiciary is Biased and Compromised, the AU and SADC inept, the International Community impotent in the wake of their alleged stolen victory…..” KIKIKIKIKIHAHAHAHAHAHAHHAAA …MASIMPE !!!!!! I agree with the article. I would not be surprised to hear the pontiff blamed. UPND and HH have been everywhere, including Paradise to hide money. Paradise papers can confirm this. Let political parties in Zambia begin to respect and accord each other dignity. PF are being too insensitive here. Oh for lack of an independent institution such as America’s FBI, so that such malice and mudslinging would not have been allowed to take sway. Zambian politicians are nothing more than clever kids playing hide and seek. We see government as paternal when, in all likelihood, it is a spoiled child; as being the police officer, protecting us and our own, when it is the thief, stealing from us; as being the executioner of justice, when in actuality, it is the criminal doing us harm. Among any grouping there is always a f00l. If you keep looking for a f00l in the group and can’t find any, it simply means it is you. UPND are still looking for whole stole their vote more than a year ago and can not find any. Just a observe the actions of Lungu after the polls shud give all balanced thinking individuals the probability that he stole votes. The best remedy could ‘ve been to go all the way and shame HH with the truth. Anything less is sheer THEFT by PF. STAND with the righteous and you will ‘ve peace of mind. THERE IS ALWAYS PAPER TRAIL. THE VOTES THAT WERE CAST AT THE POLLING STATIONS WERE DISPLAYED AT THE POLLING STATION. AND THE SAME VOTES WERE SENT TO MULUNGUSHI ICC, AND THE SAME VOTES WERE ANNOUNCED BY ECZ. AND UPND HAD AGENTS AT EACH OF THOSE POINTS WITH SATELLITE PHONES TO VERIFY. SO TELL ME. AT WHICH POINT WAS THIS TRAIL BROKEN? WHERE WERE VOTES STOLEN? OR TELL ME WHERE THERE WAS ANY DISPARITY. EVEN CHIVULA AT MULUNGUSHI ICC COULD NOT CHANGE PAPER TRAIL. Produce “paper trail” then. Where is the “paper trail” you wanker? At the cemetery?